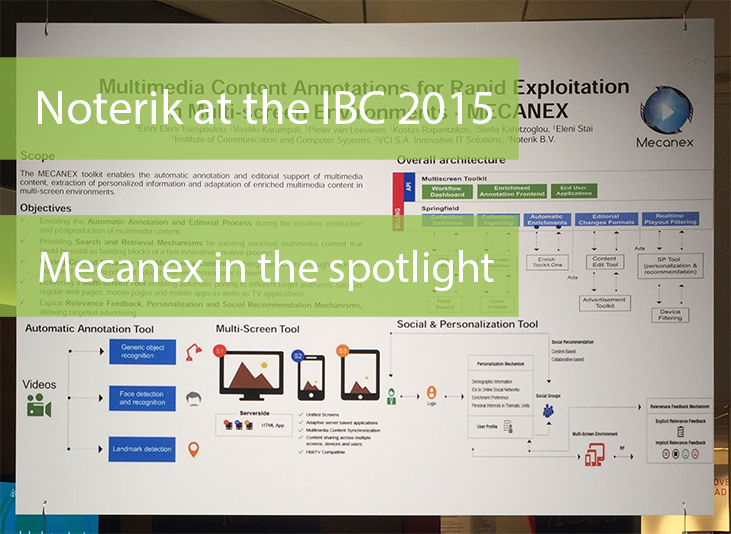 The MECANEX project features a toolkit that enables the automatic annotation and editorial support of multimedia content, extraction of personalized information and adaptation of enriched multimedia content in multi-screen environments. The multiscreen toolkit developed by Noterik plays an important role in the the project. QANDR is our new product built on the multiscreen toolkit platform. The main goal of QANDR is the engagement of audiences. QANDR facilitates this by giving the presenter or moderator the opportunity to push various interactive elements like polls, word clouds and compass graphs to mobile phones in the audience. This allows for real time feedback during presentations. QANDR can be used in many different settings such as congresses, festivals, business meetings and brainstorm sessions. IBC2015 was widely agreed to be the most successful yet. Conference delegates from more than 250 top level speakers in a sharply improved environment; exhibition visitors had more than 1,800 vendors to choose from; and everyone enjoyed innovations from a hackfest to a drone zone. The total number of visitors, 55,128 to IBC2015 exceeded the record-breaking attendance in 2014. The event found ever more ways to engage with the community, ensuring that everyone who attended joined the debate about the future of electronic media.